Syms, E. Leigh. "Brockinton Archaeological Site". The Canadian Encyclopedia, 04 March 2015, Historica Canada. https://www.thecanadianencyclopedia.ca/en/article/brockinton-archaeological-site. Accessed 23 April 2019. Sherds and artistic rendition of a vessel from the Williams culture. The sherds were found in the top occupation of the site, dated to about A.D. 1600 (courtesy Dale Walde and E. Leigh Syms). 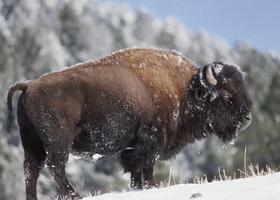 Wood Buffalo was established in 1922, largely as a home for the remnant population of bison that escaped the slaughter in the late 19th century (Corel Professional Photos). 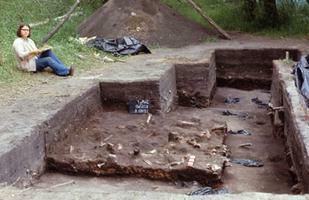 The excavations at Brockinton (1971) revealed a bone bed from the area of the bison pound. It corresponds to the earliest occupation of the site, dated to about AD 800 (courtesy E. Leigh Syms). The Brockinton archaeological site, also known as the Brockinton Indian Sites National Historic Site of Canada, is located along the valley wall of the Souris River of southwestern Manitoba. It is a stratified site that has yielded evidence of three distinct occupations: an early bison kill and butchering pound about 800 AD, a Duck Bay culture occupation about 1100-1350 AD, and the first excavated evidence of the Williams culture about 1600 AD. The bison pound consisted of a series of posts from 15 to 25 cm in diameter placed in the ground to a depth of 20-40 cm. The posts were placed among the trees in a long row that was about 1.5 m wide. Based on pounds recorded during the early Fur Trade Period, the pound at Brockinton would have been held together by horizontal branches and saplings intertwined among the posts and trees, and gaps would have been covered with hides. The bison were driven over the edge of the steep valley wall where they ran and tumbled into the structure at the bottom of the valley. What is special about the Brockinton pound is that it provided one of the first and best documented cases of the rare occurrence of a pound structure being systematically dismantled and the post molds being in-filled solidly with clusters of vertical bison bones. The pound was hurriedly abandoned, leaving behind a record of basic butchering with minimal bone breakage. It yielded one of the greatest concentrations of small Prairie side-notched arrows, ranging from 20 to 90 points per unit (2 m2). The overlying Duck Bay culture campsite demonstrated evidence of a Woodland First Nations group adapting to seasonal bison hunting. In addition to sherds of their large distinctive Woodland pottery with cord-wrapped-object impressions and shallow stamps, they left endscrapers, bifaces, and projectile points, including broken bases that had been discarded when arrows were repaired with new points. They adopted a number of Plains traits including the use of Knife River flint from western North Dakota for tool-making, and flat milling stones for grinding seeds. Three miniature stone awls and a rare (in Manitoba) channelled sandstone abrader for smoothing wooden shafts were also found. The animal remains from this occupation reflected a mixed economy. They included bison, canines, beaver, deer or antelope, and fish bones. The final Williams culture campsite showed the primary reliance upon bison of a Plains group that is distinguished by a uniquely decorated range of pottery. It included small bowls, some with incurved s-rims decorated with two-strand twisted cord impressions in triangular and horizontal motifs and tiny hollow stamps created by reeds, bird feather quills, or tiny bird bones. A couple of vessels with dense paste, smooth semi-polished surfaces and broad trailed decoration appear to have Oneota connections to the south in southern Minnesota or Iowa. The Oneota include several groups that occupied the Prairie Peninsula between about 1000 and 1650 AD. The range of village debris at Brockinton included endscrapers, bifaces, worked flakes, arrow points (including bases left during repairs to arrows), bone awls and needles, and fragments of tubular smoking pipes made from red pipestone (probably catlinite) and gray pipestone (steatite). 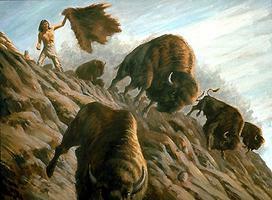 See also Buffalo Hunt; Head-Smashed-In Buffalo Jump.